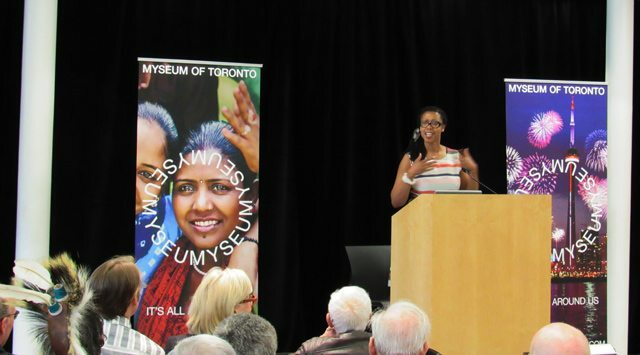 Myseum of Toronto executive director Karen Carter introduces the initiative’s concept. It doesn’t have a dedicated physical space. Its name will irritate spell-checkers. But those behind the Myseum of Toronto initiative hope their efforts to create a non-traditional historical institution will spur community involvement in documenting the evolution of our city. In short, it wants to turn the entire city into a living museum exhibit designed by you. Unlike past proposals for an overall civic museum, which have envisioned sites like Old City Hall and the Canada Malting silos for a permanent space, the Myseum will exist as an online presence (including Facebook and Twitter) and through pop-up events. The first, “Myseum on the Move,” will send a bus around the city in late June to collect artifacts and stories from the public to help build its digital collection. This method of gathering material drew comparisons to library bookmobile programs. It also highlights the “my” portion of the initiative’s name, allowing the public to shape the material being presented. Myseum executive director Karen Carter, who previously held the same position at Heritage Toronto, repeatedly mentioned at the launch the concept of “co-creation” of exhibits with the public. She views the initiative as an opportunity to foster civic pride through “a greater recognition of this city’s value, increasing our recognition of this city as an essential place for urban narratives.” Regarding the Myseum’s name, which was created in association with brand management firm Interbrand, Carter noted that the organization wanted to respect past attempts to create a “Museum of Toronto,” yet not use that label.